To integrate VWO with your website on the ExpressionEngine CMS, all you need to do is add VWO Smart Code on the pages you want to test. After the code snippet is added, you can use VWO to track visitor data or create A/B, split URL, or multivariate tests to optimize the website. Sign in to your ExpressionEngine account administrator panel, and then select Developer > Templates Manager. 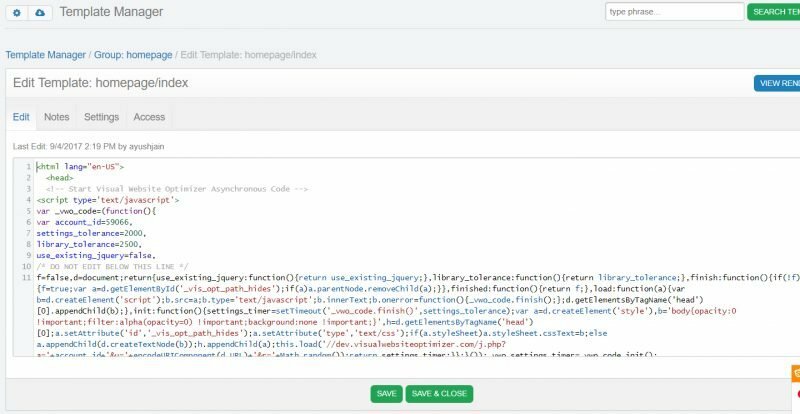 Click the template where you want to add the VWO code snippet. Usually, this is the main template that manages the head section of the entire website. After the template editor is loaded, add the VWO code snippet within the <head></head> section of the template. To update the changes, click Save.